Attention, a new Zombie Survival Kit Lunch Box is in the town and don’t forget to get hold of the hot product. 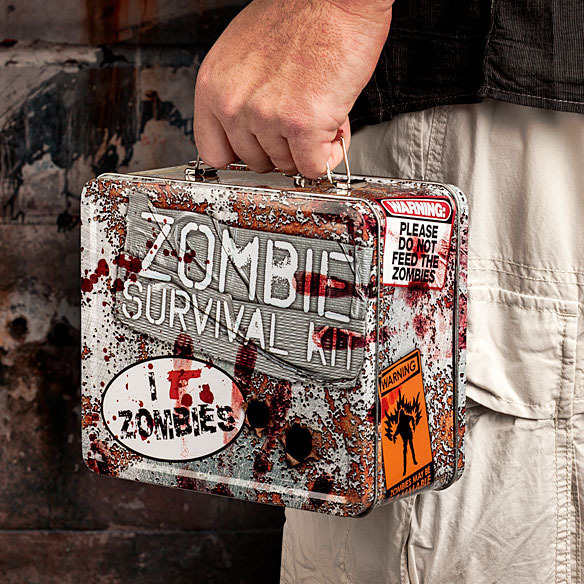 The Zombie Survival Kit Lunch Box is a metal lunch box ready to hold in your entire zombie fighting fuel. Pack it with Twinkies, Tactical Bacon, caffeinated gum, and energy drinks, everything you'll need to stay alive. It will surely come handy during zombie apocalypse. This product is necessary for you to fight hordes of zombies. When the food is over, you can place weapons in it for surviving zombie attacks. It is made of Metal w/plastic handle and the dimensions are 7.75″ x 6.75″ x 4″. It is one of the most useful survival tools in the market and the great lunch box is just priced at $12.99. It is brand new and officially licensed.